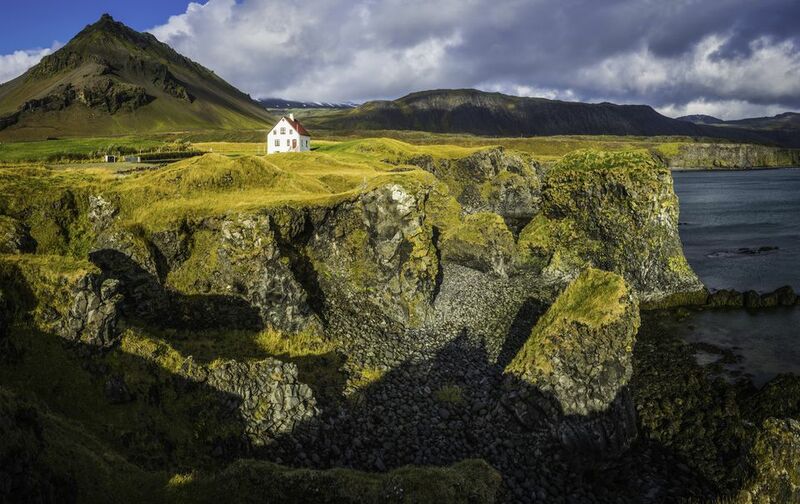 If you want to experience all of the geological wonders Iceland has to offer over the course of one afternoon, head northwest of Reykjavik and into Snæfellsjökull National Park. Snæfellsjökull has some of the most photographed sights in Iceland, from the Instagram-famous Budirkirkja and Kirkjufell to the region's namesake glacier and Lóndrangar, the stone towers seen around the world on "Game of Thrones." If you're heading to the westfjords, this is an easy stop on your way. But if you were planning on only heading south, consider adding a detour to your trip to visit Snæfellsjökull. The area you pass on your drive is called Hvalfjörður or Whale Fjord. It used to be a common spot to pass migrating whales. Today, it's a very popular spot for travelers heading to the Westfjords to stop off for a scenic driving break. The national park is surrounded by a handful of towns, the largest being Olafsvik, Rif, and Hellissandur. These villages have a history as some of the most important fishing hubs in the country over the past 1,000 years. The nearby Breiðafjörður bay is to thank for the region's fishing success: it's easy access to the ocean prompted fishing stations to be built all around the region. Today, fishing still exists, but tourism has also contributed to keeping this area of the country buzzing. Snaefellsjokull National Park battles the westfjords region for being the westernmost point of the country. There are two ways to get to Snaefellsjokull from Reykjavik: the 3.5-mile Hvalfjörður Tunnel (which has a ~$10 toll) or the more scenic route along Route 1 that will add about an hour to your travel time. Taking the tunnel route will get your from Reykjavik to the national park in just under three hours. There is no grand sign (although, there is one) to greet you at the entrance to the park. In fact, you won't be able to see a huge difference between the area surrounding the park and the actual park. Much of Iceland is covered in lava rock fields and Snaefellsjokull National Park is no exception. For this reason, you'll want to do a little research before you visit. While there are directive signs pointing out the various landmarks — some of the best sights are slightly hidden. Read up on local blogs to find the very best spots worth your hard-earned vacation time. Guide to Iceland and I Heart Reykjavik are two blogs that are useful for general knowledge. Kirkjufell: Known as "Church Mountain," you'll be hard-pressed to find a time when this area is not full of photographers. You can walk around the base of the mountain, but there is a more challenging hike up the steep incline. At a certain point, there's a rope that was placed by locals that will help you keep balance. Hire a guide if you're taking on the more challenging hike — they can also point out the fossils the mountain is known for. Don't miss the nearby waterfalls, Kirkujufellsfoss. They're small and you can climb to the top of them in less than a minute. There's a great view of the mountain from the falls, as well. Lóndrangar: Lóndrangar is actually the remains of a crater, today appearing as a set of towers jutting out into the ocean. You can walk all the way up to the towers via path called Þúfubjarg that will take you away from the parking lot and closer to the beach. Make sure and look back, as well — the proximity to Snæfellsjökull is not to be taken lightly. Djúpalónssandur Beach: This black sand beach is located behind Budirkirkja and is home to a wealth of tourist delights. Nicknamed the Black Lava Pearl Beach, there's a path (Nautastígur) from the nearby parking lot that will take you through a lava field with huge rock formations. Behind the path, you'll find two deep lagoons that give the beach its name (it translates to "Deep Lagoon's Sand"). It's thought that Guðmundur the Good once blessed these waters. You may also see pieces of an airplane, left behind from The Epine GY7 wreck that happened on March 13, 1948. Also keep an eye out for Söngklettur, or the Singing Rock, which is said to be the Church of the Elves. Saxhóll Volcano Crater: You can climb all over this extinct volcano crater. A set of stairs has been added to the side of Saxhóll Crater, winding you around the side and up to a fantastic view of the surround national park. It gets quite windy, so be careful as you're navigating the rocky terrain. The crater itself is large, but there are still dangerous ledges. Vatnshellir: A spiral staircase will take you 115 feet underground into an 8,000-year-old lava tube system. The only way to enter is by paying an entry fee to the tour company that will (safely) bring you into the tube and Vanshellir. Tours of this cave run hourly between 10 a.m. and 6 p.m. during the summer and twice a day during the wintertime. The cave is a 10-minute drive from the town of Arnarstapi. Snaefellsjokull Glacier: This glacier-topped volcano is more than 700,000 years old and can even be seen from Reykjavik. There are a ton of tour operators who will take you hiking on the glacier. Fun fact: This is where Jules Verne's "Journey to the Center of the Earth" originated. If you want to spend the night next to what may be the most-photographed church in Iceland, head to Hotel Budir. While the nicest option, there are a handful of other accommodations in the area: Fosshotel Hellnar, Hotel Olafsvik, and Arnarstapi Hotel. Airbnb is also a great resource if you're looking for a more local experience.